AXIS P1364 delivers HD TV 720p video at 50/60 frames per second with reduced noise and motion blur in demanding light conditions. The camera offers a varifocal F1.2, 2.8-8.5 mm, P-Iris, IR-corrected and CS-mount lens. Axis Zipstream technology greatly reduces bandwidth and storage requirements. Supporting WDR - Forensic Capture, video is highly optimized for forensic purposes and provides extreme levels of detail - even in very complex light conditions. Fur- thermore, AXIS P1364 includes the ability to seamlessly transition between WDR and Lightfinder modes. Remote back focus optimizes installation efficiency and ensures image sharpness. 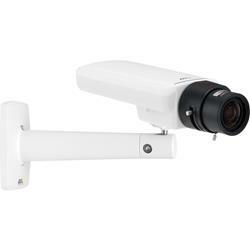 AXIS P1364 is delivered with AXIS T9 1B2 1 Stand, providing discreet cable management.